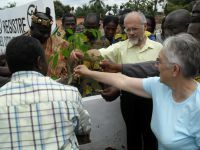 On July 2007, during a meeting between the world citizens and the association "Le pont Universel" (Togo and Switzerland), was planted the second "World Unity and Peace" Tree in KOHE. On November 2007,during the first day of the Peoples Congress and ASCOP plenary session , the participants coming from 12 different countries went to EBEN EZER (Liege, Belgium) near the Peace Tower to plant the third World Unity Tree. Every participant was invited to bring a little bit of soil from its own country to feed the tree. 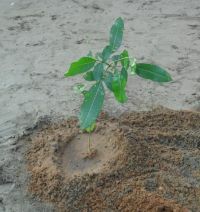 On 8 November 2008, during the second day of the Seminar for Global Studies, the Aqua Apple has been planted along CHEMU ROAD, MAMPROBI at Lartebiokorshie, Accra, Ghana (lead in Senior Secondary School near DAN WRIGHT ). A plaque will be sealed to the wall of the nearby school. In the closing session of the Peoples Congress held in Brasilia (Paraiso na Terra) from May 11 to 15, participants have planted 20 mango trees in a row of trees forming a grove of 'global unity. 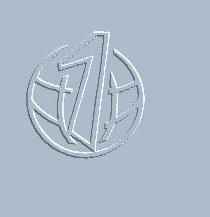 in a public place or open access to the public.